"Deduplication reduces this to a tiny fraction of the backup size"
P.C. Richard & Son is a leading electronics retailer in the greater New York area, with over 60 locations and a comprehensive on-line business. In a dynamic and competitive market with fast-moving inventory and sales, protecting their data is crucial to business management. They were increasingly aware that their data backup processes were slow and unreliable, putting their operations at risk if there was a failure anywhere in the process. To reduce this exposure, they turned to their long-time technology support team at ABC Services in Melville, NY, for help. After careful analysis of their needs and the alternatives, a Cybernetics Virtual Tape Library was chosen for their Long Island NY headquarters, and a second unit was deployed at their backup data repository site in New Jersey. The deduplication feature of the Cybernetics hardware was a key factor in this successful implementation. Not only does this ensure their data is backed up in a minimum of disk space, but the replication to their DR site needs less communications bandwidth. The deduplication ratio achieved with the Cybernetics VTL depends on the day and amount of data but they often see over a 100:1 reduction, or less than 1% of the full backup size. Michael Re, who manages the system, says that the biggest advantages he sees are the system's speed and the ability to back up multiple servers at the same time. The Cybernetics VTL they use can execute sixteen simultaneous backup jobs, and is capable of ingesting data at over 4TB per hour. This makes short work of their backups, and deduplication then reduces this to a tiny fraction of the backup size. Michael said the browser-based interface was a plus. And he also appreciates the excellent technical support he has received from Cybernetics. The support provided is from knowledgeable engineers and is U.S.-based from Cybernetics headquarters in Virginia. It's unlimited lifetime support, regardless of the status of the warranty on the hardware. P.C. 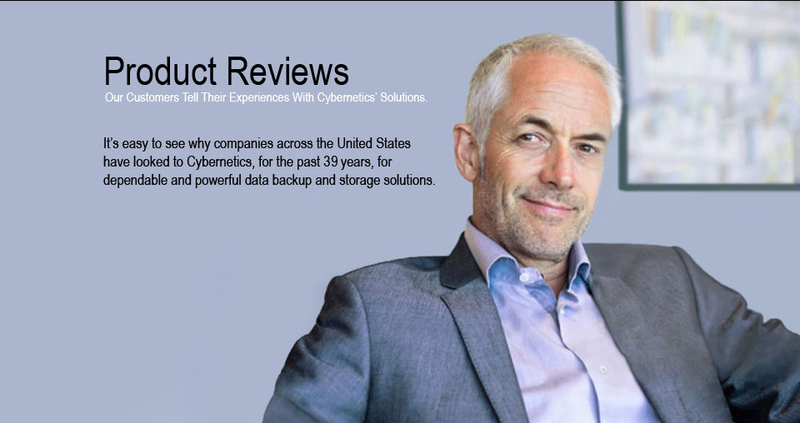 Richard & Son is just one of many satisfied ABC Services customers who are using Cybernetics systems for backup and primary storage. "I have been very pleased dealing with Cybernetics. I hope to do much more business in the future."